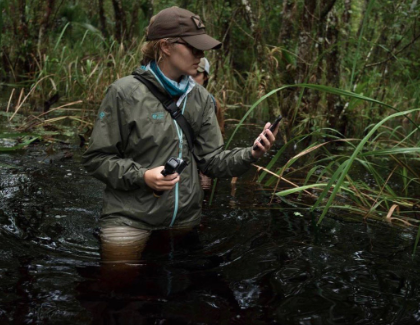 Tori Linder is the Director of Path of the Panther, an ambitious storytelling effort identifying the land protection and wildlife crossings needed to keep the Everglades connected to North America and save a future for the Florida Panther. She first got mud on her boots (field experience) in Africa. She worked with local governments, indigenous communities and the private sector on a social enterprise model that provided communities benefits for their conservation efforts. From tagging lions and commuting in bush planes to exploring new cultures, it was a fantastic adventure. But Florida kept calling her back. Home needed help, too. Now, Tori is working with colleagues to tell the story of the Florida panther and in turn promote conservation of the Florida Wildlife Corridor. Whether she’s in murky swamp water or standing a swarm of mosquitos (sometimes both,) Tori’s spreading the word: it’s good for us (you know, humans) to take care of our home.